Buying a new vehicle is one of the biggest purchases you can make and your Detroit Area Honda Dealers want to help you make an informed decision. If you’re in the market for a midsize sedan, you have probably researched the segment’s top models like the 2018 Ford Fusion, 2018 Hyundai Sonata, 2018 Kia Optima, 2018 Nissan Altima, 2018 Toyota Camry, and of course, the award-winning 2018 Honda Accord. With so many great options to choose from, why should Southgate car buyers put the 2018 Accord at the top of their lists? When most car shoppers set out to buy a new automobile, it’s safe to say their primary concern is the sticker price. However, since your vehicle is a long-term investment, it’s important to look beyond the MSRP and calculate the cost to own. So what does “cost to own” actually mean? A simple formula can determine the true value of a vehicle: depreciation + out of pocket expenses = your cost to own. Estimating your out of pocket expenses is a crucial part of determining the cost to own—just remember, where you live will influence everything from gas prices and car insurance to auto financing rates and vehicle registration fees. Great fuel economy is a must for today’s modern driver; however, car shoppers will often times sacrifice power for efficiency. Luckily, the 2018 Honda Accord LX not only produces up to 192 horsepower, but it also achieves a remarkable, EPA-estimated 30 mpg city and 38 mpg highway.1 Fuel economy can be one of the biggest factors when it comes to determining cost to own. 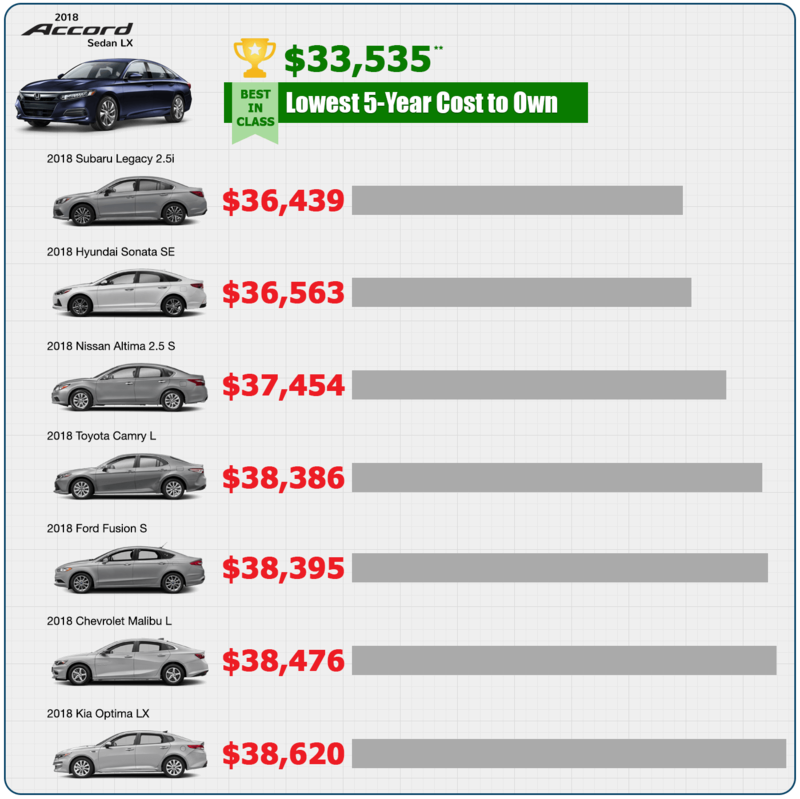 Click here to see how the top midsize sedans stack up. In September of 2017, Clark.com (a byproduct of Clark Howard and his consumer advocacy efforts) shared data from YourMechanic.com that listed the most and least expensive vehicles to maintain. Based on estimates of total maintenance over a 10-year time period, Honda was ranked 27th out of 30 brands. Notably, Ford, Kia, Chevrolet, Subaru, and Hyundai were more costly to maintain, all ranking in the top 20. Unexpected car expenses are never fun, and major automotive repairs can have an adverse effect on your vehicle’s residual value. 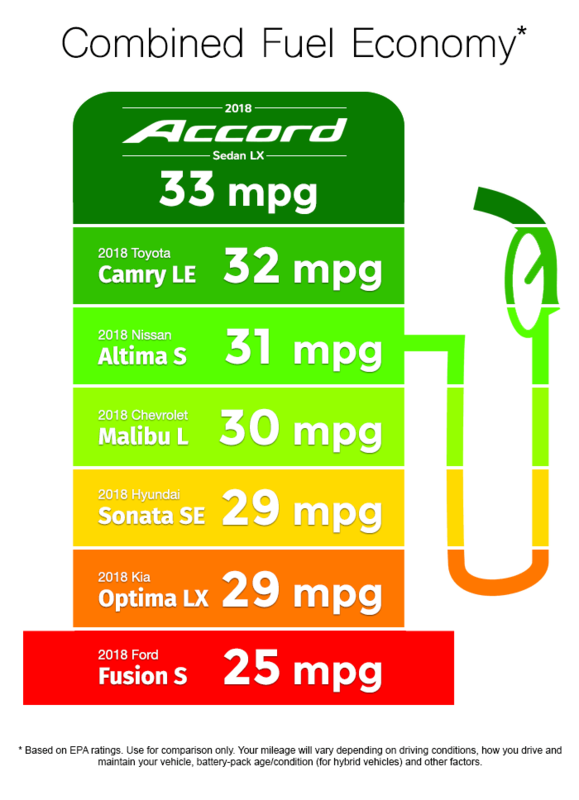 Recent results from CarMD’s 2017 Vehicle Health Index show Acura to be the least likely to require an “engine repair check” over the past year, while Honda and Toyota rounded out the top three, respectively. Premiums can vary for many different reasons, but one undeniable truth is insurance companies love safe vehicles. 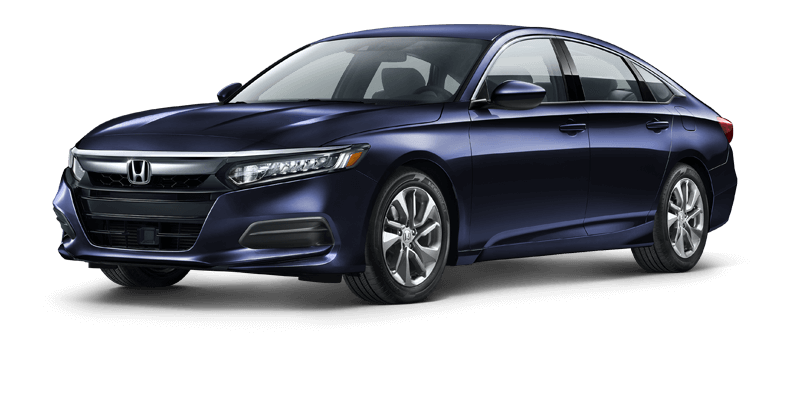 Thanks in part to standard equipped Honda Sensing technologies, the 2018 Honda Accord Sedan LX earned 5-Star Ratings from the National Highway Traffic Safety Administration (NHTSA) in every single crash test category,2 leaving competitors like the 2018 Chevrolet Malibu, 2018 Ford Fusion, and 2018 Nissan Altima to play catch up. State fees include license, registration, and a state’s sales tax. When it comes to registration, some states assess a flat fee, while others use metrics such as fuel economy, the vehicle’s age, or the gross weight of the automobile. If you are unfamiliar with the criteria used by your state to calculate registration fees, visit the National Conference of State Legislatures (NCSL) to learn more. The bottom line: knowing the cost to own before you buy will help save you money in the long run. With an outstanding residual value after both three and five years, and less overall out of pocket expenses than its midsize competitors, the 2018 Honda Accord Sedan is a smart investment. Visit any Detroit Area Honda Dealers today to explore the six different trim levels, learn about current incentives, and test drive the 2018 North American Car of the Year, the 2018 Honda Accord Sedan. * Vehicles’ projected resale value is specific to the 2018 model year. ** $23,570 MSRP excludes tax, license, registration, $895.00 destination charge and options. Dealers set their own prices. † KBB.com. Visit https://www.kbb.com/new-cars/total-cost-of-ownership/ for more information. Residual values as of 3/6/2018. Based on EPA ratings. Use for comparison only. Your mileage will vary depending on driving conditions, how you drive and maintain your vehicle, battery-pack age/condition (for hybrid vehicles) and other factors. Starting with 2011 models, NHTSA has introduced tougher tests and rigorous new 5-Star Safety Ratings that provide more information about vehicle safety and crash avoidance technologies. 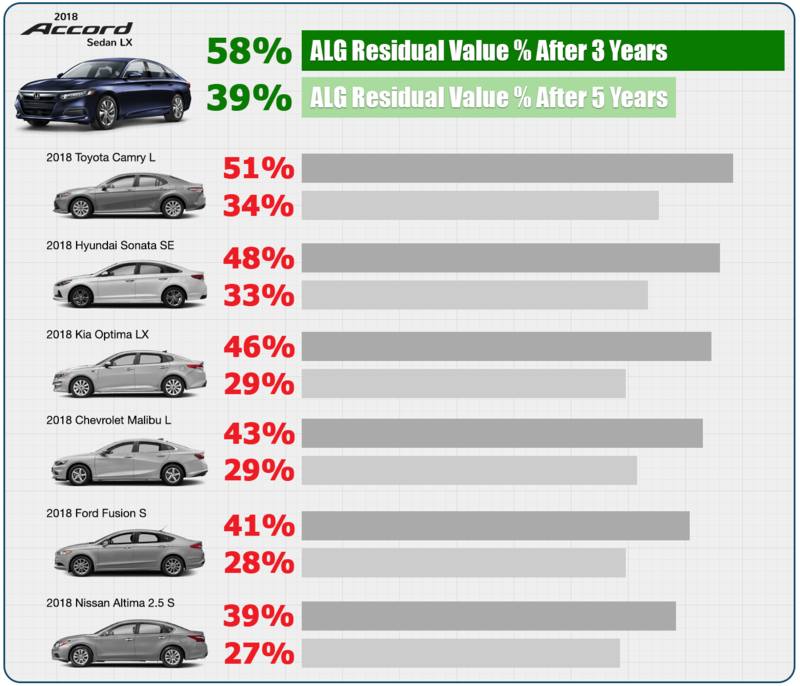 Because of the more stringent tests, ratings for 2011 and newer vehicles should not be compared to ratings for 1990-2010 models. Overall vehicle score and frontal crash ratings should ONLY be compared to other vehicles of similar size and weight. For more information go to www.safercar.gov.